“As a child, Chris Hooper dreamed of monsters. But in deep space, he found only darkness and isolation. Then, on planet LV178, he and his fellow miners discovered a storm-scoured, sand-blasted hell – and trimonite, the hardest material known to man. The Alien series has a minor presence in the world of audio stories. Back in the early 90’s Lance Henriksen recorded an abridged reading of Alan Dean Foster’s Alien 3 novelization and in December 2015 Audible released new unabridged recordings of all four novelizations read by William Hope and Peter Guinness. And that’s was it. Then Alien Day 2016 rolled around and Audible released the Alien – Out of the Shadows audio drama. It is an adaptation of Tim Lebbon’s Alien – Out of the Shadows. Lebbon’s novel was the first in a trilogy published by Titan Books that saw Alien return to the novel format after a 5-year absence. When I say audio drama, I want to establish that this is not one person reading the book aloud to you – this is a full cast audio drama based on the book. And the man responsible for creating Alien’s debut in the world of audio drama? None other than Dirk Maggs. Maggs is a well-known name in the field of audio drama, having been responsible for countless works including several comic book adaptations in the late 80’s and early 90’s. He was also the man behind finishing The Hitchhiker’s Guide to the Galaxy radio series at the behest of creator Douglas Adams. Maggs’ adaptation of Tim Lebbon’s novel is very faithful, making very few changes to the story to accommodate the audio format. The most notable change is the increased presence of Ash and allowing for the character to have a speaking role (he communicated via text on a computer screen in the novel). This allowed for him to get more from Rutger Hauer, the actor cast to replace Ian Holm. 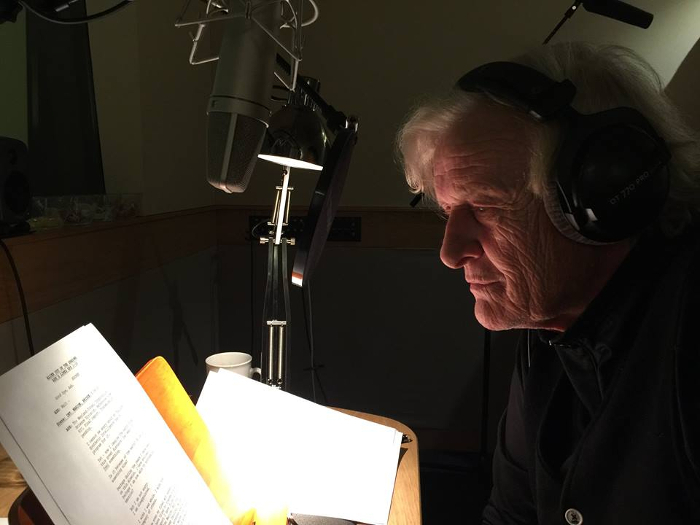 Rutger Hauer performs his lines as Ash in the Alien – Out of the Shadows audio drama. Rutger Hauer is, of course, famous for playing the character of Roy Batty in Sir Ridley Scott’s other seminal science fiction, Blade Runner. I think the casting of Rutger was just ingenious. It has a very nice symmetry in getting an actor of another of Ridley Scott’s artificial people to portray Ash and an actor of such good caliber too, bringing much of his own poetic nature to the role as Ash descends into his own digital madness. He almost serves as a narrator or dungeon master type character throughout, helping to keep the story moving. Some may have an issue with the change in actor thought and that change in voice is explained by the use of a Seegson voice synthesizer. Closer ties to Alien: Isolation was another change that Maggs made to the story and it was something I really enjoyed it. References to Working Joes and Seegson are scattered throughout the Alien – Out of the Shadows audio drama. It came across just as much as a nod of respect and thanks to Creative Assembly from Dirk Maggs as it did further world building towards the current coherent continuity that 20th Century Fox is establishing. Many of the sound effects present in the Alien – Out of the Shadows audio drama are from Alien: Isolation. Considering that one of the many accolades that Alien: Isolation received was a BAFTA for Best Audio Achievement, it was a great choice to utilize their library of sound effects. They immediately lent the drama a sense of grounding and familiarity. It feels so Alien based off some of those sound effects alone. James Hannigan provides the score for the Alien – Out of the Shadows audio drama, using aspects of Alien, Alien: Isolation and Rebellion’s Aliens vs. Predator to continue that sense of belonging. His own original material is weaved in there to great effect, helping to support the consistently awesome sound design throughout the drama. Not all of the changes are for the best, though. In an effort to make the runtime more reasonable, bits and pieces of the book are trimmed off. There was one particular piece of trimming that I thought was a detriment to the drama and that was the build up to the “big red button” moment at the end. As with the novel itself, Ripley inclusion in the Alien – Out of the Shadows audio drama is a looming presence that constantly has the reader/listener wondering how it will resolve. Maggs keeps the same solution but the build up to the moment is largely excised which I think led to a less believable resolution to the problem. In the novelization Ripley is subjected to constant torment from visceral nightmares of Amanda dying throughout the novel, they don’t get a mention in the audio adaptation until the last third or so. There were a couple of other small issues I had – Ash knowing of the existence of the Queen before seeing one and Maggs not using the opportunity to fix some of the errors within Lebbon’s novel such as there only being mention of a single cryotube in the Narcissus when the film shows two. It’s nothing major but some may pick up on those. The cover art for Alien – Out of the Shadows audio drama. As with Ash and Ian Holm, Sigourney Weaver was unable to return to reprise her role as Ripley. Stepping into those immensely large shoes is Alien series alumni, Laurel Lefkow, who played the role of Katya in Rebellion’s Aliens vs. Predator (2010) She is remarkable as Ripley. Aside from a few moments early on where Lefkow sounded like she was pronouncing Nostromo as Nostroma, she just slipped into the role as if it were her own. I sometimes forgot I was not listening to Sigourney Weaver. Also joining Lefkow are fellow Alien veterans Andrea Deck and Mac McDonald who previously played Amanda Ripley in Alien Isolation and Simpson in Aliens both of whom do a fantastic job as their respective characters. In fact, the entire cast is nothing but amazing. As with the previously mentioned issue with Lefkow and the Nostroma, the only issue I had with the cast seems small and petty, which was with Kathryn Drysdale’s accent. Fans from the United Kingdom will recognize her as Louise from Two Pints of Lager and a Packet of Crisps. In the Alien: Out of the Shadows audio drama she plays Sneddon, the science officer aboard the Marion, the ship the majority of the drama takes place on. I found her accent to be a little inconsistent at times. Like I said – small and petty. I loved Corey Johnson as Hoop, the main character aside from Ripley. Hoop is probably one of my favorite characters from the expanded universe. I think Johnson brought a real likeability and sense of genuineness to the character that only made me love the character even more. Dirk alongside the cast of the Alien – Out of the Shadows audio drama. The cast includes Aliens’ Mac McDonald, Alien: Isolation’s Amanda Ripley and Two Pints of Lager and a Packet of Crisps’ Kathryn Drysdale. The Alien: Out of the Shadows audio drama was just a perfect way to spend 4 and a half hours of my life. I really enjoy the audio drama format, however there just are not many I am interested in. My experience with them comes via Big Finish’s Dr Who and Stargate dramas and various fan produced Star Trek pieces, all of which have been really high quality. When I saw that this was coming I was just ridiculously excited to finally experience an Alien audio drama and had such high hopes for it. Dirk Maggs met all those hopes. I really hope we will see more of these adventures. Whether original stories or more adaptations of Titan’s books, as long as they meet the quality of this production I have no doubt I’ll be a happy chap. As I stated above, I had some minor nit-picks with the Alien – Out of the Shadows audio drama and those that had issues with the original novel will still have those issues here. But the overall experience was just amazing. The Alien – Out of the Shadows audio drama is simply an essential listen for Alien fans. From Corporal Hicks here at Alien vs. Predator Galaxy, I recommend you head on over to Audible and purchase the Alien – Out of the Shadows audio drama.And you should do it right now. I’m listenning to it right now, and it is fantastic. Make more please ! Really this was a crowning achievement for the Alien franchise. More of these, please! Can you shed any insight on future plans for more audio dramas? Big shoes to fill after this one, no doubt, but it can be done. The voices were spot on, the acting was believable and the story works. I would have given it a 10/10 but only because I feel the need to support the people who made this and voice my opinion to have more of these created. I thought is was a fantastic listen. I haven’t read to book so I can’t compare, but stand alone I loved it. I had just listened to the audiobook versions of the films that Audible had and it was perfect timing. The audio is fantastic and makes for an outstanding listen, I personally haven’t heard anything as good. It’s a good pace too, I highly recommend it. Currently listening to “Predator: Incursion” Audiobook and then it’ll be “Alien: Invasion” after that. Do we know if there are any plans for “Sea of sorrows” or “River of pain”? Wow so much awesome in one review! I need to find that Lance Henrikson Alien 3 audiobook. And i never noticed there were two cryotubes in the Narcissus. One thing that erked me was how concerned the characters were about the cramped conditions in the shuttle. I found the Narcissus to be quite spacious whenever i watch Alien. Also, another concern, maybe the conversation happened off camera but if the Narcissus took a detour wouldn’t the inquiry in Aliens mention this? I’m sure there must have been a black box. There was sure as hell a flight recorder.